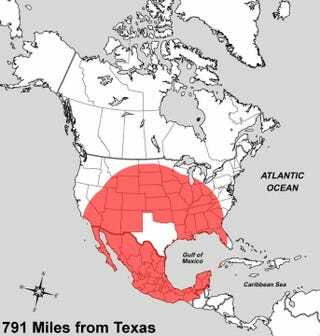 Texas is 791 miles long (just over 268,000 square miles). This map shows how far away 791 miles stretch from our borders. We have cities that are closer to cities in different states on different coasts than they are to other Texas cities. We have cities that are closer to capital cities in other countries than they are to other Texas cities. You can drive all the live long day and still be inside the state's borders. In pretty much every other part of the country, driving all the live long day will get you past five different states, at least! Anyway, this lovely infographic was presented by Corpus Christi website klll.com (link below). Their little write-up draws some pretty interesting comparisons about the sizes and distances of things in Texas. For example, did you know the distance between Dallas and Ft. Worth is longer than the length of the Gaza Strip? It's an entertaining article and is spot on on just about everything. My one point of contention is why anyone would want to go to the beach in Corpus. Clearly, the best beach in the state is South Padre Island. But it would take an hour flight from Houston (1.5 or so from Dallas) plus a 30-45 minute drive afterwards just to get to it. And if you decide to drive the whole way from those cities to SPI? Eight hours from Houston, about 11-12 from Dallas. Yeah, Texas is big, y'all. BIG!